The European Parliament has narrowly voted to allow a weakened Fuel Quality Directive, a modest climate measure to reduce emissions from transport fuel by 6 per cent by 2020, to proceed. Originally the Directive included a label identifying tar sands as a high carbon fuel, thereby discouraging it's use. This label was removed after heavy, well funded lobbying on the part of federal and Albertan governments, and industry. This Wednesday the European Union (EU) Parliament will again vote on the proposed EU Fuel Quality Directive (FQD), a modest climate measure to reduce emissions from transport fuel by 6 per cent by 2020. This is the latest in what has become a long, drawn out, multi-year saga for what should be a straight forward decision. And it’s entirely Canada’s fault. Okay, perhaps that’s a slight overstatement. It’s entirely the fault of multi-million dollar lobbying and public relations campaign on behalf of the Canadian and Albertan governments and industry. The goal is to stop the FQD from assigning specific carbon intensity to tar sands crude. In other words, to stop a tar sands value recognizing it as a particularly carbon polluting crude to produce. Not only could this be a model for other countries and jurisdictions to follow in discouraging the use of climate polluting fuels like tar sands, it could present a barrier to EU tar sands imports. It’s been a week since our Atlantic Energy East tour wrapped up, and what a whirlwind it has been. The tour was ambitious with the hosting of 5 public forums, a series of meetings and site visits. On the frontlines in Atlantic Canada – what is at risk with the Energy East pipeline. After a successful event in Halifax we headed to Cornwallis, a small community of around 400, near Digby and Annapolis Royal. 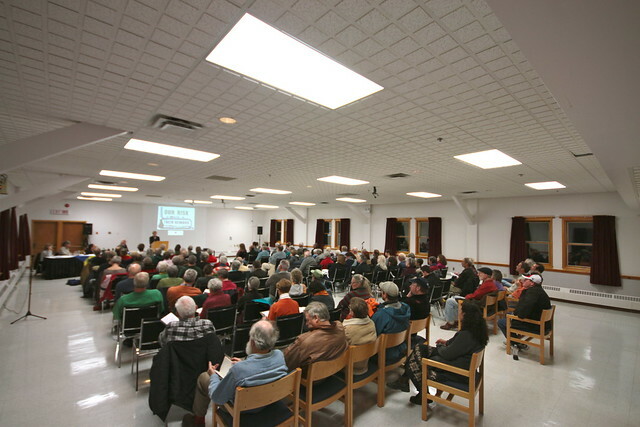 The evening public forum saw 130 local residents join us for a lively discussion facilitated by Hague, a nearby resident who used to work for Environment Canada. From Cornwallis, we made our way to Saint John for another public forum, stopping in Sackville New Brunswick to meet with local residents, students and professors that are at the heart of an amazing local fightback against fracking, and other social justice work. Read more about On the frontlines in Atlantic Canada – what is at risk with the Energy East pipeline. Last night public forum in Halifax kicked off a two week tour about why Energy East is all risk and little reward for Atlantic Canada. What a powerhouse panel and discussion. Following an introduction from me describing the project and outlining our core concerns around pipeline safety, marine spills and climate concerns with the pipeline, Cherri Foytlin talked to the audience. I don’t think there was anyone in the room not moved by what they heard. Read more about Last night public forum in Halifax kicked off a two week tour about why Energy East is all risk and little reward for Atlantic Canada. TransCanada should be filing their Energy East pipeline project with the National Energy Board soon. This quick starts an up to 18 month process where the Board reviews TransCanada’s pipeline application and gives a final recommendation to the federal Cabinet which then has 180 days to make a final decision. The Council of Canadians is opposed to the Energy East pipeline which is all risk and no reward. I'm still recovering from a pretty incredible experience this past weekend at the People's Climate March. With a last count of 400,000 people strong, it indeed was the largest climate march in history, and one of the largest social movement moments in years. One more sleep till an early morning departure tomorrow to New York, and I have to admit, I’m getting pretty excited. The last couple of days have been filled with last minute details – over 400 other ‘bus captains’ are probably facing the same influx of emails and inquiries. I’ll be leaving Ottawa tomorrow at 7am with 54 others ranging in age from 11 to 70 and reasons for attending, but united in finding the time and energy to participate in what is being billed as the largest climate march in history. The march is planned before heads of states meet to discuss climate change at a UN Climate Summit called by Ban Ki Moon. Fracking fightback: Attack source and destination? Opposition to fracking has swept the world in recent years, and rightly so. Dramatic images of tap water set on fire, compelling stories of people suffering from water and land contamination and clear scientific research documenting the risks. Much of this activism has focused on stopping fracking at the source, and this has seen real success. The decision to prohibit fracking with a moratorium in Nova Scotia being a recent example. Read more about Fracking fightback: Attack source and destination? In 18 days, I will be boarding a bus alongside 53 Ottawans (one of several Canadian buses) to join a historic people’s climate march in New York city. The face of climate change is increasingly visible, with extreme weather events becoming regular news. Not only is this having serious environmental impacts, it is hurting people. Lack of access to water. Destroyed homes. Wilted crops and cracked earth. It is hurting our economies.